Yesterday I drove over to Madison, Fla., about 50 miles east of Tallahassee. 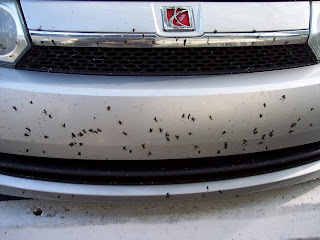 With every splat, I realized it's love bug season! I spent about an hour yesterday scrubbing the buggers off, this time I didn't use the scrubby side of the sponge (like last year, which is not a good thing for the car). Another tip about car care I've learned over the years, don't use a soda/beer can to scrape ice off a windshield. That's a Yellowstone story and not a pretty sight. When an ice scraper isn't available, use a credit card.